What was your favorite moment of the Andrew Bogut era with the Cleveland Cavaliers? It’s definitely a tough question, since there were just so many memories. Was it his checking in for the first time in last night’s beat-down loss to the Miami Heat? Or how about the team tweeting out a pic of his jersey in the locker room? And we’ll always have those two fouls he committed. All jokes aside, you couldn’t help but feel crushed when Bogut, one of Cleveland’s marquee waiver pickups, played for a whole minute last night before fracturing his tibia. In just 60 seconds, the Cavs went from having a capable rim protector to looking at yet another hole on the roster. Many felt Bogut’s addition was the final piece needed to make another championship run this spring. Now, the belief is the Cavs are once again facing concerning depth issues which may hurt them in the long run. I’m not here to shrug off Bogut’s injury. You can’t help but feel bad for him, as freak accidents have followed him throughout his career. It had to be tough to swallow for Cleveland’s other players, as well as GM David Griffin. That said, I certainly don’t see this as something which derails the Cavs’ championship hopes. While it’s certainly a hurdle Cleveland will have to overcome, Bogut’s injury shouldn’t be seen as detrimental to the team’s goal of winning another title. Again, there’s no denying last night was brutal. Front-court depth was an issue for the team, and Bogut seemed like a perfect fix. He would’ve particularly given forward Tristan Thompson meaningful rest in the month remaining before the postseason, especially with Kevin Love still healing from a knee scope. With all of that said, I still think Bogut’s loss won’t be a severe setback for Cleveland. For one, as much as the team needed more bodies down low, the biggest priority for the Cavs was a backup point guard. While coach Tyronn Lue still has Thompson, Channing Frye and Derrick Williams to play in the front court, Kyrie Irving had minimal support. Signing Deron Williams was a far more important move than bringing Bogut on board. Secondly, this injury doesn’t mean Cleveland has to just sit and watch Bogut waste a roster spot. The team can easily waive him and take another look at what’s available on the market. The Cavs are just a week or so removed from their workout of former Milwaukee Bucks forward Larry Sanders. Said audition reportedly went well. Cleveland likely saw Bogut as less of a risk since Sanders would be playing for the first time since 2015. If the Cavs felt comfortable with what they saw in Sanders, there’s no reason not to give him a call and see what can be done. If not him, there are certainly other names available. Obviously none will be as appealing as Bogut (think Kendrick Perkins), but one of them is bound to help the cause. On top of all of this, you also have to consider how Bogut would’ve been used as Cleveland went deeper into the postseason. While he definitely would’ve been a helping hand in the final few weeks of the regular season, his minutes were likely going to decline come playoff time. Remember, during last postseason Cleveland relied mostly on Love, Thompson and Frye as the main bigs. Lue dusted off Timofey Mozgov on occasion, but to say he had an impact would be a lie. To be fair, this isn’t to say Bogut would’ve been deemed useless as the postseason dragged on. It is, however, pointing out the fact minutes for him were going to eventually become tough to find. Of course, this becomes a completely different story if Cleveland is dealt another bad injury. If someone like Frye or Thompson gets hurt and the Cavs are still struggling to find a replacement for Bogut, then this setback becomes a bigger issue. As of now, though, this is something Cleveland can survive. A few adjustments are going to need to be made by Lue to absorb the blow, though. With Thompson, Frye, and Derrick Williams as the team’s only available bigs, Lue may have to go with smaller lineups. He can play James Jones or even LeBron James at the four on occasion. While it’s not ideal, it’s something Lue’s done before. 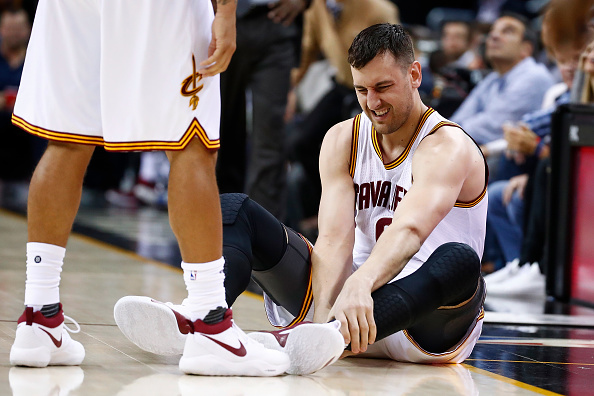 At the end of the day, Bogut’s broken leg is a tough hand to be dealt to the Cavs. You could tell by the players’ reaction they were excited to have him on board and were genuinely upset to see his time with the team end almost as quickly as it started. Despite this, Cleveland is still capable of a big playoff run. The team’s most pressing needs have already been covered, and if Griffin can quickly find a capable replacement, the Cavs should be back on the right track soon enough.